Merry Christmas and Happy Holidays from Ladew — Patricia H. Ladew Foundation, Inc.
Santa Claus and Santa Paws are Here to Wish You a Merry Christmas! At this time of celebration and merriment, all of us at the Ladew Cat Sanctuary would like to extend warm wishes for a wonderful holiday season -- and heartfelt thanks -- to all of our amazing adopters, supporters, family and friends for your support over the past year. 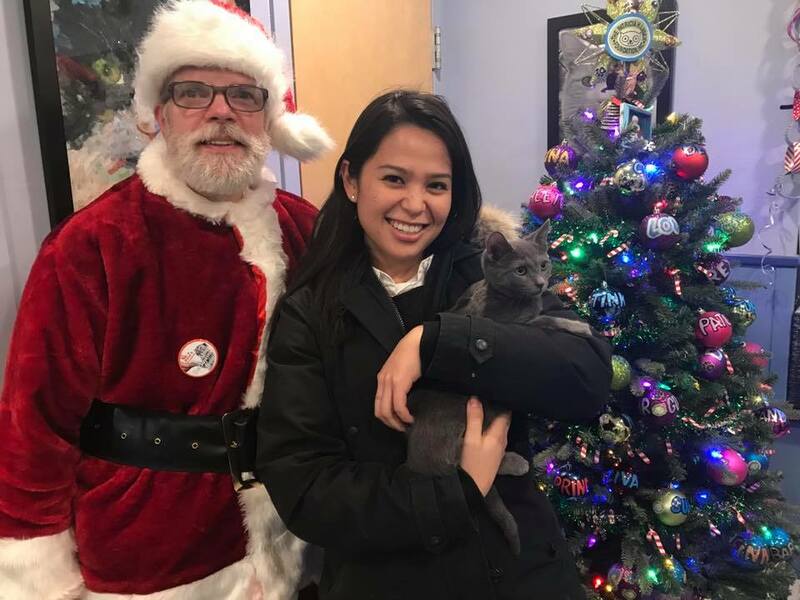 We enjoyed a very successful Winter Whiskerthon event on December 8, with several cats adopted and several more going to new homes in the following days. In fact, as we approach the year's end, we are proud to report that in 2018, more than 130 cats found their forever homes through the Ladew Cat Sanctuary and our loving adopters. We had more than 100 cats supported through our Sponsor a Cat program this year, and at Christmastime, sponsors received a gorgeous hand-painted Christmas ornament featuring their sponsored cat's name from our Sponsors Christmas Tree. Through the incredibly generous support of our friends we have been able to delivery emergency medical and surgical care to many extraordinary cats (including Tommy Pickles! ), as well as medical screening and vaccinations for all incoming cats, dental work for those who need it (most do!) and ongoing care for cats with chronic conditions such as diabetes. Our Seniors for Seniors program is taking off, enabling us to place senior kitties with loving senior citizens with no financial or long-term planning risk to the adopters because we cover all reasonable medical expenses for the kitty -- including insulin if necessary. And, as with all Ladew adoptions, the cats can always come "home" to us if for any reason circumstances change in the adopter's situation. We could not do all this without the support of our amazing network of friends and family! A huge thank you to all, with best wishes for much continued happiness and love in the New Year! From Our Family to Yours, happy holidays and a wonderful new year! Ladewbie Molly (aka Shirley, adopted 2016) enjoying Christmas in her forever home.